You have got to watch the latest music video from indie musician and human rights activist Tom Goss. Illuminate the Dark shows that beauty takes many forms and that each individual possesses the ability to be vibrant. With the video, Goss hopes to “help people see one another through the eyes of those that love them. People judge others all of the time, but if we take the time to see people as their mother, lover or sister sees them, we will begin to see what makes each individual dynamic and beautiful.” Look for an appearance by yours truly, a fabulous redhead and an awesome big brother. 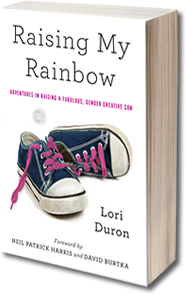 This Sunday, I’ll be at the Unitarian Universalist Church of Studio City as part of a panel discussing gender. 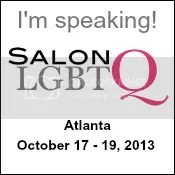 Bring your questions, your openness, and your willingness to learn! We will work to create a safe environment where there are no dumb questions! Click here to learn more about the event, which starts at noon, is free and open to all. 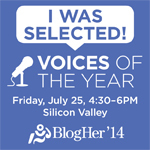 I’ve been named one of BlogHer’s 2014 Voices of the Year! BlogHer, a 100 million-strong blogging community, received thousands of submissions and selected my blog post “When The Boys’ Room Isn’t Safe For A Boy “ as a winner in the “Heart” category. As a result, WordPress Freshly Pressed the same blog post. Thanks BlogHer and WordPress! Click here to read more and learn who my fellow 2014 Voices Of The Year are. The amazing people behind Camp Aranu’tiq (a camp for transgender and gender variant youth ages eight and older and their families) have announced a new fun-filled weekend camp for LGBTQ parents/guardians and their children of any age. Extended family members are welcome, too! Click on a camp name to learn more about Camp Aranu’tiq and/or the LGBTQ Family Camp. I hope all of you mothers and adults who mother a child had a very happy Mother’s Day. C.J. made me a card at school that says he loves me most when I’m cleaning the house. So, there’s that. This entry was posted in All Posts and tagged BlogHer, Camp Aranu'tiq, Gender, gender nonconforming, Illuminate The Dark, LGBTQ, Orange County, parenting, PFLAG, Tom Goss, Voices of the Year, VOTY. Bookmark the permalink. That smile!! And I just love C. J.’s hair color. You’re such a beautiful family in so many ways 🙂 and that awesome big brother!! I want to adopt him!! Wish you and your boys a great summer! I loved finally seeing someone’s face! He’s so beautiful, Lori. What an awesome smile. Beautiful song with a beautiful video! Thank you for sharing. Thanks so much for your participation and sharing your story and wisdom today at UUCSC! Gah! Finally watched the video! I’m a big ball of sobby boo over here! So beautiful! I tracked down the video via Google; great song and it’s wonderful to be able to put faces to names (I say as I write entirely anonymously). Jeremy’s going to a big Unitarian Universalist conference this weekend (CanUUdle). He’ll be heading off with blue silk pjs and shoulder-length purple hair. And I’m wishing you were coming to our UU church because that sounds like an amazing event. Problem with your video embed. This is beautiful! I love the song and I love the message to see people as their loved ones do. It’s extra fun to see those familiar faces! Lookin good! Thanks for sharing Camp Aranu’tiq’s information. When I got their email and it said something about sharing on social media, I wasn’t sure I was truly understanding what they were saying and that it was okay to share. Every article I see about Lindsay Morris’ work keeps that camp all hush-hush, so I thought perhaps that was the protocol (which I understand, with good reason). Can’t wait to check out Goss’ new video!